Pattadese table knife for collectors, entirely handcrafted with steel blade, handle with grips in reused antique ivory with hand-decorated screwed rivets, fine floral motifs with a natural effect expertly engraved on a finished 416 stainless steel knife made to order. Single-piece handle jack knife with a bay leaf-shaped blade. Typical of Sardinian tradition, it is the result of an in-depth research on Medio Campidano country knives, suitable as a kitchen knife or a skinning tool. This pattadese jack knife is reinforced with an inner core and features a straight stainless steel blade; it is traditionally used in pastoral and contexts, its handle being made of a mutton horn and a chamfered nickel silver or brass ring. This hand-made jack knife features a classic myrtle leaf shape. The artefact is characterized by a pecurial mutton-horn handle embellished with an engraved brass guard. 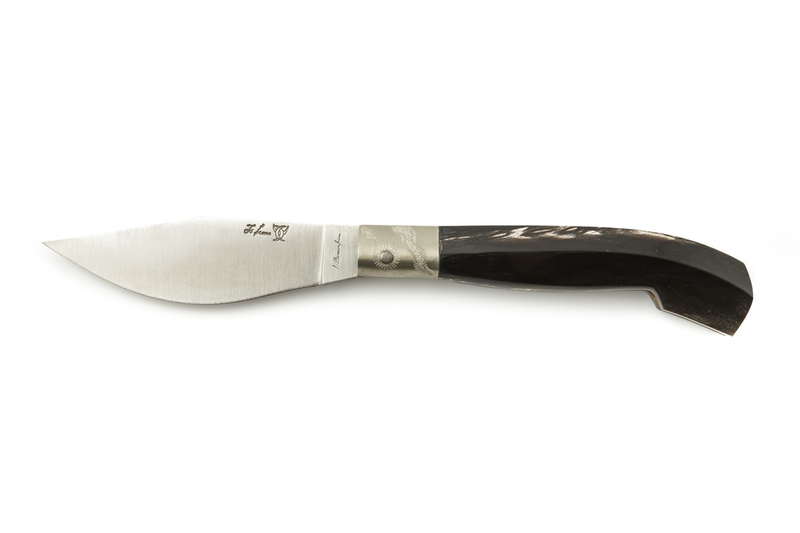 Recognisable and typical, the blunt-end blade knife, used in the local tradition by miners, is reproduced in sophisticated shapes with single-piece satin-finished buffalo horn handle and an engraved brass ring joint. The renewed and exclusive Sardinian knife sector has deep roots in ancient traditional knowledge. The refined work of knife-makers in characterized by an evocative style and high technical skills, typical of rural and pastoral contexts. Sardinian traditional knife, widely identified with a jack knife, sa resolza, is mostly used by men as a cutting tool for different purposes and always carried in their pockets. Such personal object, imbued with a symbolic charge, fascinates today's sector enthusiasts: it is a sought-after artefact, a collector's piece. New productions are inspired by tradition but also implement innovative manufacturing processes and functions. Local knife-makers' artefacts stand out for their high technical level and compositional sensitivity. Carefully crafted with a combination of different materials, the study of shape, harmony, proportion, paying due attention to functional efficiency. Artistic knives are unique pieces particularly sought-after, characterized by horn handles embellished with complex carved decorations and wrought blades, often featuring damask effects. A substantial contemporary production reinterprets traditional patterns, thoroughly following the formal canons while keeping top quality processes and materials. The renowned clasp knife of Pattada, sa resolza pattadesa, is the most popular knife in Sardinia and often identified as "the" Sardinian knife. The main feature of this handy knife, is its sophisticated handle structure and the myrtle leaf-shaped thin and pointed blade. The exclusive production of cutlery, that includes highly functional objects inspired by tradition, is connected to the production of bread, pasta and cakes, and features innovative tools used to slice and dice meat cuts, and mince spices.